"Since our leaders always complain that the filmmakers speak ill of their country, I dedicate this award to Italy and the Italians who do everything to make the best for Italy, despite their leaders." 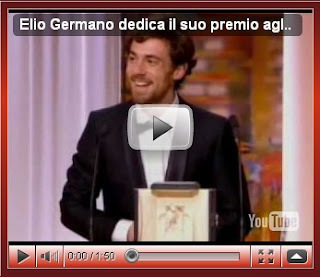 With these words yesterday Elio Germano received the award for best actor at Cannes, ex aequo with Javier Bardem. The fearless Augusto Minzolini and his heroic Tg1 (Italian most important tv news) have cut the message under a technical hitch, but now it’s a classic and doesn’t merit even half post. The most interesting thing is the comment by Germano. In essence, the just celebrated actor argues that our politicians don’t work to improve the country but rather hinder the people who do. Italy is a founding member of European Union and participated in all the main treaties of unification of the continent, including the entry in the Euro zone in 1999. Furthermore, it is also a founding member of NATO, Council of Europe and the Western European Union, joined the United Nations and is part of the G7, G8 and OECD. Are we kidding or what? Do we want to suggest that the leaders of such great country are worst than its inhabitants? Can we say that in Italy there are more sincere people than Silvio Berlusconi? Women and men whose word is his most reliable? Most credible of the Prime Minister?! If we had to believe to an actor - because even if awarded at Cannes, we're always talking about an actor, not a democratically elected deputy with the votes of Italians, then this would mean that in our country there are smarter people than Maurizio Gasparri. Do you really think this is probable? But how many people there will be more intelligent than Gasparri? Sure, I could also mention Minister Roberto Calderoli, at random, but it’s the same. Let's stop with this paradoxical defeatism. We are Italy, a nation which sits at the table with the big States of the world. If Germano was right, then we would have a more reliable population than Minister Giulio Tremonti. If you don’t know, we're talking about a man who heads the Ministry of Economy, perhaps the most important of all. Tremonti is the person who manages our money. He would be less reliable than what? One? Two? A hundred? A thousand?! An why has he become minister? Why was he elected? You have no answer, don’t you? It’s easy to take a prize at Cannes and shoot crap on our leadership. Because it was a crap, the boy is young and was caught by the enthusiasm of victory. And maybe they are more honest than the latter.